Now people are looking for cheapest smart TV with 3D and with maximum facilities such as built in camera.SAMSUNG came into its brand new Ultra high definition TV. 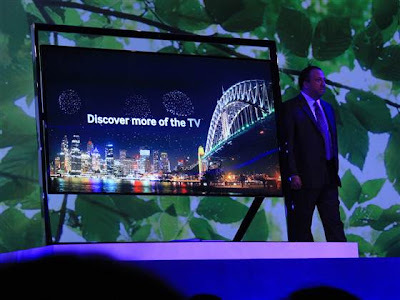 Jan 7,2013,Samsung's 84-inch "ultra high definition" TV, wheeled out on stage at a CES press conference in Las Vegas, and is expected to go on sale in select countries this year itself. Last year Sony and LG was the real players with they came with 84-Inch HDTV.Samsung as well as Panasonic are introducing these Ultra High Definition TVs this year. The unbelievable fact is TV has over 8 million pixels, and screen sizes will range from 50 to a whopping 110 inches.Ultra high definition are the TV equivalent of the Apple's iPhone’s “Retina” screen . Ultra High Definition have the resolution of 3840 x 2160. For normal 1080 pixel televisions at larger and larger sizes, you need to have to keep increasing the size of the individual pixels.With the invention of Ultra high definition TV the individual pixels remain small and sometimes get smaller, which makes that a super quality resolution.There were not much invention happen after the HD came . Ultra high definition TV is best when viewed at about half the optimum distance of any HDTV. The 84-inches Ultra high definition TV can be viewed as close five and a half feet or six feet. You will have the feel of a IMAX theater in your home. Normally a 3D have half the resolution of a full HD picture and annoying line structure, “cross-talk” ghost images and a lack of brightness.Ultra high definition TV rectifies all these problems .